This is my first script in Blender (excluding the game engine). It will generate the profile mesh of a 4-digit NACA Airfoil. Thoughts, comments, criticisms, whatever are welcome! did you do it in 3D fro instance ? i’v seen papers describing the equations for these! Wow. I was just wondering if there was something like this. A great start for building wings. Thanks for this. One small issue though. If the third group is a single digit, the resulting name in the outliner is a three digit number. What about the other series? There are hypenated ones too. As for propellors, most are NACA airfoils. You’ll have to do research to determine the airfoil used, there are resources out there. http://www.ae.illinois.edu/m-selig/ads/aircraft.html is an incomplete list. 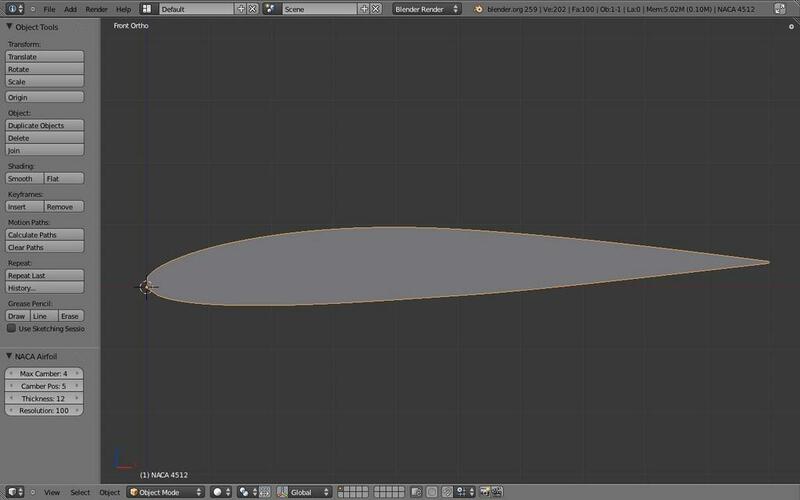 RickyBlender, like Corey said, most propellers are NACA airfoils, sometimes blending between multiple airfoils with different scales. It’s possible to add other NACA series. I did the 4-digit series because they are the simplest and most common. Feel free to add them yourself. I’m not sure if Blender allows for dynamic changes to the menu or not, but if so, then that would simplify having multiple series. Corey, Thanks for pointing out the bug with object names, and I’m glad you have found it useful. See my response to RickyBlender about other NACA series. anyone knows how to connect like B-24 and the prop and wing for this plane? i mean i can see list of prop but this does not tell me on which airplane they where used? i mean a prop usually is twisted along main axis so how can you use this cross section to make the twisted prop? PM me if possible i don’t really come very often on this forum and just saw the respone today! Does anyone know which aerofoil is used in designing boomerangs or any of the NACA 4-series aerofoil can be used?